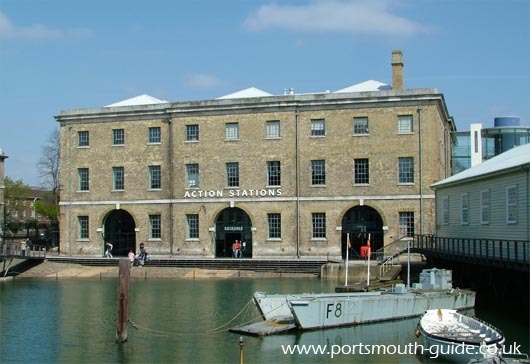 Action Stations is a new development in Boathouse six of Portsmouth historic dockyard, Portsmouth. Action Stations is a £14m attraction that opened May 2001 and was part funded by the Millennium Commission. Boat house six, the home to Action Stations, was built in 1846 and was constructed with a cast iron frame which can be seen from the picture below. The picture below was taken during the refurbishment of the building to house the display. During World War II the west end of the first and second floors was destroyed and was covered with corrugated iron which remained until the 1970s when the Navy no longer needed the building. In 1986 Boathouse no 6 became part of the Historic Dockyard estate and in 1996 designing Action Stations started. The bomb damaged area has now been used to house the cinema and circular class stair tower. The exhibition consists of "The Navy Today", the Royal Navy fleet represented by video, graphics and objects, "Command Approved", the film shows the Navy in an action packed drama combining piracy, excitement, danger and intrigue. The "Team Works" is an interactive game that enables you to test your skills and see if you have got what it takes to be part of the Royal Navy. The exhibition also consists of interactive areas, helicopter flight deck, the bridge, the operations room and weapons room. The exhibition also has a simulator to experience the Royal Navy. There is a Royal Marines Island which is an interactive display that allows you to climb a moving wall. The Action Stations exhibit opened with features about it on local television and it appears to have been a hit with all ages. The action stations display is part of Portsmouth Historic Dockyard. For more information about this attraction please see the Portsmouth Historic Dockyard website.